In case you need to find a single item or several items in a long list of tasks you can use Find and Filter Bar. Two modes of filtering are available. You can start typing part of title (part of assigned user name and etc.) The list of tasks will be shown accordingly. This is Simple Filter mode. Or you can apply Advanced Filter mode for tasks and define filtering parameters of tasks you need to find. Click “Advanced Filter”. 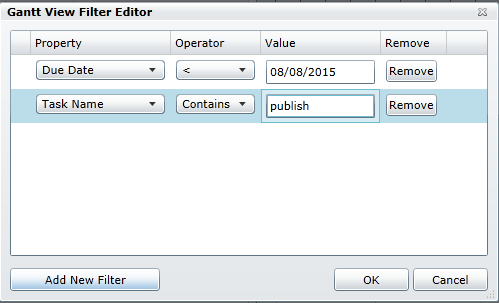 Then define custom filter in the displayed window with “Add new filter” button. Click “OK” to save filter. Tasks will be displayed according to this filter. You can switch it off by unchecking the checkbox. To switch back to Simple Filter mode click “Simple Filter”. To delete filter uncheck the checkbox. Note: filter settings are saved in Silverlight Application Storage for current user machine. You can define whether find and filter bar will be hidden or shown by default. Go to web part settings, roll down to “Gantt settings” and check/uncheck the box “Show Find and Navigation Bar”. Click “Save” to save the settings.